Patients that were conclusively diagnosed by investigations such as CT scan, of having cerebral infarcts as an eventuality after a stroke with score <20 on NIHSS. 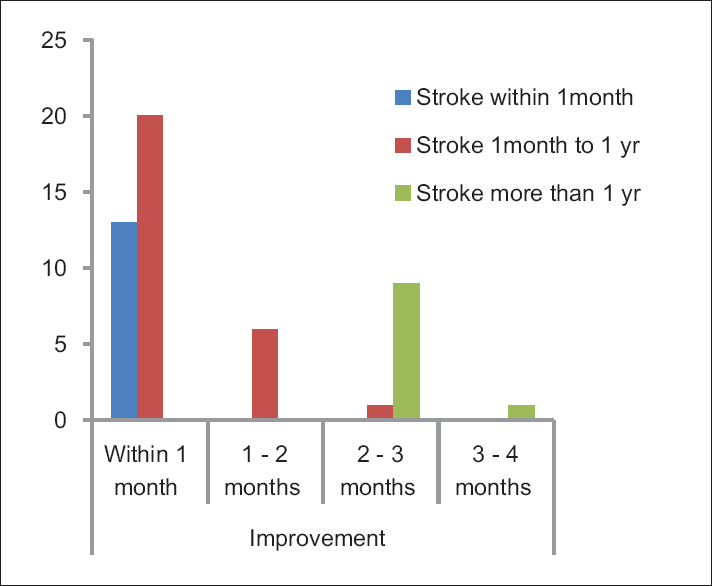 Patients with severe stroke manifestations i.e., where the NIHSS score is more than 20. During the 3-year study, 118 patients with cerebral infarct were screened, out of whom 31 were excluded, 87 patients were enrolled out of whom 27 patients dropped out and 10 patients were withdrawn. Data of 50 patients have been analysed. Of these 50 patients, 10 patients had stroke episodes more than 1 year back, 27 patients had stroke episode for more than 1 month but <1 year back while 13 patients had stroke episodes <1 month. The data of these three groups have been analysed separately as shown in [Table 1]. Thirty-six (72%) patients presented with a duration of more than 3 weeks of illness (chronic) and among them 27 (75%) patients showed signs of improvement. Eight (16%) patients were with a duration of 3 days–3 weeks (subacute) of illness, and among them, 5 (62.5%) patients showed signs of improvement. Five (10%) patients were with a duration of 6 h–3 days (acute) of illness and among them 5 (100%) patients showed signs of improvement and only 1 case (2%) was enrolled with a duration of <6 h of illness and showed signs of improvement, when symptomatically assessed. 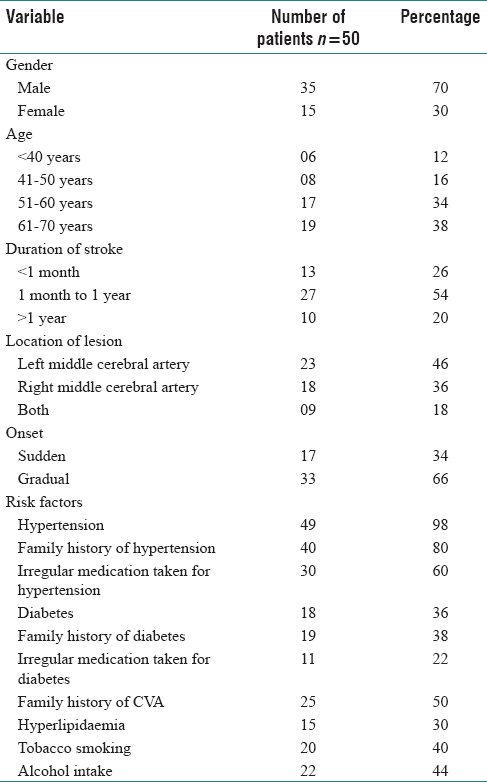 Various risk factors identified in stroke patients such as smoking, alcohol, family history of hypertension and diabetes are given in [Table 1]. Among those, eight patients reported both smoking and alcohol intake. Significant reduction in NIHSS score was seen in all three groups of patients as given in [Table 2]. The changes in individual symptomatology and the time of initiation of improvement [Figure 1] are given in [Table 3] and [Table 4], respectively. Eleven homoeopathic medicines which were used as adjuvant to the conventional care (which included medicines such as blood thinners and TPA) showed no drug interactions or adverse events during the treatment period. Causticum (n = 14, 28%) was the most frequently used medicine followed by Arnica montana(n = 9, 18%), Nux vomica (n = 9, 18%), Lycopodium (n = 7, 14%) and Lachesis (n = 4, 8%). Other medicines used were Conium maculatum (n = 1, 2%), Arsenic album (n = 1, 2%), Baryta carb (n = 1, 2%), Bothrops (n = 1, 2%), Calcarea carbonica (n = 1, 2%), Phosphorus (n = 1, 2%) and Ignatia (n = 1, 2%) as given in [Table 5]. 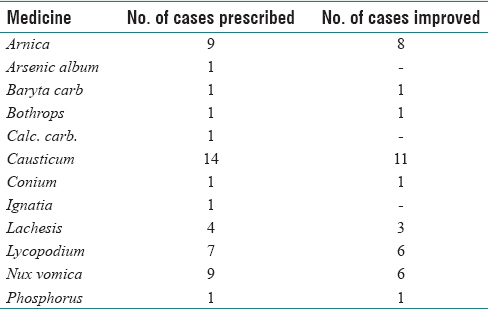 The characteristic indications of the medicines found useful in four or more patients are given in [Table 6]. To ascertain effects of the risk factors on NIHSS score. Warlow C. Stroke, transient ischaemic attacks, and intracranial venous thrombosis. In: Donaghy M, editor. Brain's Diseases of the Nervous System. 11th ed. UK: Oxford University Press; 2002. p. 776. Allen CM, Lueck CJ. Neurological disease. In: Haslett C, Chilvers ER, Boon AN, Colledge RN, editors. Davidson's Principles and Practice of Medicine. 19th ed. London: Churchill Livingstone; 2002. p. 1160-1. Furberg CD. Natural Statins and Stroke Risk [Editorial]. Circulation 1999;99:185-8. Murphy R. Homoeopathic Medical Repertory. 2nd Rep. Ed. New Delhi: B. Jain Publishers (P) Ltd.; 2004. p. 440-1. Robert HM. Clinical stroke scales. Hand Book of Neurology Rating Scales. 2nd ed., Ch. 9. New York: Demos Medical Publishing; 2006. p. 262-4. Boericke W. Pocket Manual of Homoeopathic Materia Medica & Repertory. 9th ed. New Delhi: B. Jain Publishers (P) Ltd.; 2001. p. 399-463. William BH. Physiological Materia Medica. 3rd ed. New Delhi: B. Jain Publishers (P) Ltd.; 2005. p. 256-8. Hahnemann S. Organon of Medicine. 5th & 6th ed. New Delhi: B. Jain Publishers (P) Ltd.; 1994. Adams HP Jr., Davis PH, Leira EC, Chang KC, Bendixen BH, Clarke WR, et al. Baseline NIH stroke scale score strongly predicts outcome after stroke: A report of the trial of org 10172 in acute stroke treatment (TOAST). Neurology 1999;53(1):126-31. Mohr JP, Lazar MR, Marshall SR. Middle cerebral artery disease. In: Mohr JP, Wolf AP, Grotta CJ, Moskowitz AM, Mayberg RM, Kummer VR, editors. Stroke, Pathophysiology, Diagnosis and Management. 5th ed. Philadelphia: Elsevier Inc.; 2011. p. 384-94. Li C, Engström G, Hedblad B, Berglund G, Janzon L. Blood pressure control and risk of stroke: A population-based prospective cohort study. Stroke 2005;36(4):725-30. Ernst E, Pittler MH. Efficacy of homeopathic arnica: A systematic review of placebo-controlled clinical trials. Arch Surg 1998;133(11):1187-90. Khuwaja G, Ishrat T, Khan MB, Raza SS, Ahmad Khan MM, Ahmad A, et al. Protective role of homoeopathic medicines on cerebral ischaemia in animals. Indian J Res Homoeopathy 2014;8(4):209-17. De Reuck J, Paemeleire K, Van Maele G, Goethals M. The prognostic significance of changes in lesion size of established cerebral infarcts on computed tomography of the brain. Cerebrovasc Dis 2004;17(4):320-5. Moritani T, Ekholm S, Westesson PL. Infarction. Diffuse-Weighted MR Imaging of the Brain. Ch. 5. New York: Springer Berlin Heidelberg; 2005. p. 39-54.